Are the right people paying the price? NO! 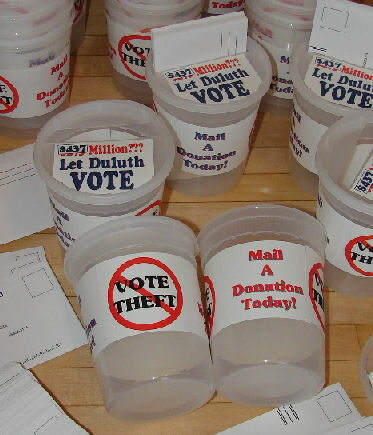 On Monday, June 1st, 2009 the Duluth Chamber of Commerce (after a year of embarrassed silence on the Red Plan) has been prodded to re-embrace it. They paid for a study which discovered the multiplier effect. If you spend a buck it becomes a buck fifty as other people spend the money you've spent. Surprise, surprise, that's what the sophisticated economic software discovered will happen when Duluth spends $293 million on the Red Plan. But as the study's author quickly agreed. This tells us nothing else. Will our schools be better? Are the right people footing the bill. Could the multiplier effect be reversed by negative consequences of the much panned Red Plan. Let Duluth Vote prepared a brief analysis of its own suggesting that the Red Plan may cause long term harm to the economy. The Chamber did not want it to be passed out but a few people picked up copies as they left the meeting. There were a lot of architects, contractors and JCI suits at this luncheon. Supporters and opponents of the Red Plan both want Duluth’s Public Schools to be the best in Minnesota . Originally the Red Plan was described as a step in this direction. As the plan has come under attack there has been a greater reliance on describing its beneficial economic impact on Duluth than its educational affect. 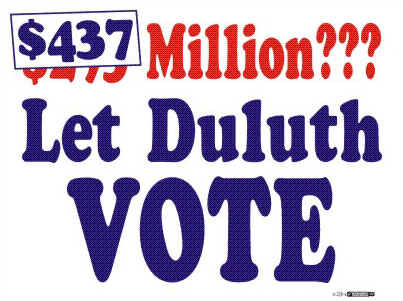 Clearly some people will benefit from spending $300 million at least in the short term Let Duluth Vote would like the BBER to address these following questions. If the completion of the Red Plan results in a damaged school system with lost programs, students and the revenue that follows them and new maintenance expenses for schools that are suffering from unanticipated out-migration how will the damage to the reputation of the Duluth schools affect local business and efforts to attract new business to Duluth and the local economy? Would a short term economic benefit outweigh long term economic problems? 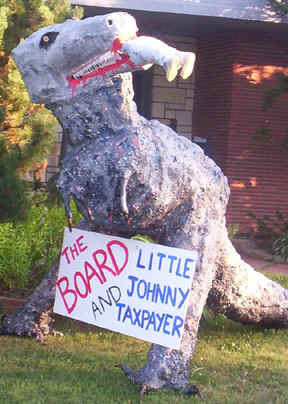 Because the Red Plan will transfer wealth away from residents who live on fixed incomes several questions are in order. Unlike the Federal Stimulus Plan which is based on progressive income taxes and on the Federal Government’s ability to mint money the Red Plan will be paid for by regressive property taxes. Even now many Duluth businesses are protesting ruinous property tax appraisals even though the past decade has witnessed significant reductions in business property taxes. This is all happening, as today’s column in the Duluth News Tribune (6-1-2009) points out at a time when state government is forcing dramatic increases in property taxes by cutting back state aid to local government. The precipitous growth in property taxes, the 56% increase in Duluth school taxes in 2008 as well as a dramatic increase in inflation will be a triple whammy on Duluth ’s fixed income population. Considering this, what economic benefits can property tax payers expect from the Red Plan and the additional tax increases its completion will require? Does Chamber of Commerce’s BBER study take into account the negative impacts on different Duluth neighborhoods? For instance Morgan Park, Lincoln , Central Hillside Duluth Heights will all lose schools. The Ordean site will lose some of its desirability and result in decreased home valuations. Some of these neighborhoods are already challenged with the blight associated with poverty. Has the BBER study analyzed the costs will be imposed on Duluth as a result of blighted neighborhoods and lost home valuations? It has become apparent that a major out migration of Duluth resident students is taking place. See attached documents. By next year as much as ten percent of the traditional Duluth public school population could have fled ISD 709 Schools. It can be expected that among the first students to flee will be those whose families put a very high premium on education which could significantly skew our school population toward students who require more resources. This will also have the ironic result of leaving Duluth with excess school capacity a problem which the Red Plan was intended to solve. Ongoing and continuing staff reductions will mirror the 10% loss of students. This loss is not necessarily irreversible but once students leave it will be very hard to win them back. Has the BBER study investigated this out-migration and would it predict that the new school buildings will have countervailing benefits? Duluth taxpayers are still paying off millions of dollars on bonds for recent improvements on school buildings and athletic sites which will still have to be paid off even though the sites will be torn down or abandoned. Does the BBER study take this into account? 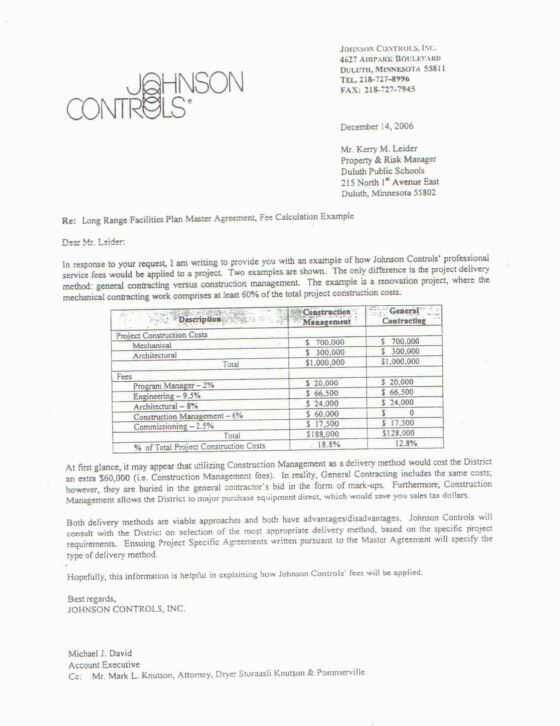 *In a letter to the District the current project manager Johnson Controls indicated that the usual costs for construction management were in the neighborhood of 12.8% but that they estimated their charges would be18.8% or six percent greater. Would it not be prudent for Duluth to avoid this additional 6% management costs and keep this money in the local economy rather than sending it to Milwaukee , Wisconsin ? No transportation study was completed before the construction of the Red Plan. However the School Administration estimated that annual increased fuel costs for bussing more students longer distances to school could match or exceed $400,000 dollars. As fuel prices face further increases so to will this annual drain of the school operations budget. Similarly Johnson Controls and the School Administration have denied the existence of any data having to do with the existing air quality of our schools. Yet almost a third of the Red Plan’s costs are being spent to address air quality. Much of this cost comes in the form of energy intensive air conditioning the use of which will drive up energy costs to operate Duluth ’s Schools. Did the BBER analyze the affect of increased energy usage in the Duluth Schools? There is currently a significant uproar over the environmental consequences of placing a high school on the Ordean site. The new plans for Ordean have set it on a smaller site than originally planned and added new structures which will tax the neighborhood. Impervious surfaces have been greatly expanded and will compromise runoff into Lake Superior and could lead to further Federal intervention. Has the BBER analyzed long term environmental costs of the Red Plan? Mr. Digby who has helped prepare the BBER Red Plan economic study also was recently appointed to the Duluth Planning Commission. That commission will meet on June 18th to vote on whether to require an Environmental Impact Study on the Ordean site. Will Mr. Digby recuse himself from that vote? Roughly 70% of the Duluth School ’s operational revenue comes from the State, 7 % from the federal government and 23% from local property taxes. As students decline so to does the operational revenue. The following figures show the financial situation the Duluth schools find themselves in as the Red Plan ramps up for an expedited completion. The figures demonstrate the precipitous and ongoing decline in student numbers driven largely by out-migration to other school systems. In Minnesota real students are converted into a formula called a WADM or Weighted Average Daily Membership. The state only pays for a half day of Kindergarten so school districts are only reimbursed at a WADM rate of .612 for these students whereas secondary students receive 1.3 WADMs of state revenue. The graph below shows how much revenue a WADM’s worth of students has meant for Districts over the past twenty five years. As of 2007 a WADM was worth $7,802 to a school District. This year’s open enrollment figures for Duluth show that open enrollment has increased greatly. Duluth is no longer a magnet for students from other school districts. 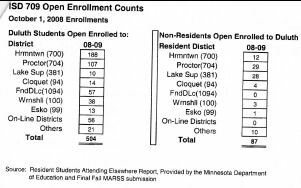 This year Duluth has a net loss of 417 students to open enrollment. At about $8,000 per student this is a total loss of approximately $3.3 million. But this is also a loss to Duluth taxpayers whose 23% share of educating these students must be turned over to the District’s they enroll into. That cost is in excess of $775,000 annually. But the loss to the Duluth Schools does not end here. Calls to three surrounding school districts shows that an additional 80 students will be added to the Hermantown, Proctor and Wrenshall school’s next year. Hermantown also has a waiting list. While any student leaving the Duluth schools will cost the District state revenue not all of them are open enrolled. Charter Students aren’t open enrollment students but their loss to a district costs it revenue. Last year the Edison Schools in Duluth picked up an additional 80 students and expect an increase of another 80 this year. In two years this has cost ISD 709 another 160 students. This is not a loss to local taxpayers as locally generated revenue does not go to charter schools. 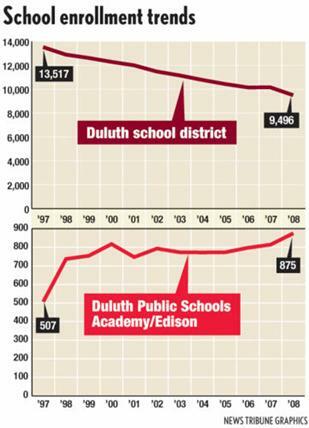 This graphic from the Duluth News Tribune shows Edison ’s meteoric growth. There have been other losses to the Duluth School District . The Marshall school recently added a second class of fifth graders and a recent column in the Duluth News Tribunes Opinion Page (Parents cry foul over ouster of beloved St. James principal) 5-17-2009 by Chuck Frederick. The story explains that St. James school has seen a 75% increase in students. This suggests a loss of nearly 70 public school students and this is just one of four Duluth parochial schools drawing students away from the public schools. There has also been as small increase in home schooling. This 1997 document shows that unlike today the Duluth School District was a magnet which drew in more students from other Districts than it lost to other districts. This letter is an affidavit in the taxpayer's case against JCI and ISD 709's contract. It shows that JCI expects to earn an additional 6% over the usual management of the Red Plan.